You can never have too much marketing collateral. That’s because its value is transferable across various mediums, internal departments and company objectives. By definition, marketing collateral is a compilation of media in all of its forms. And this collection can be leveraged for unlimited purposes. Just as the physical, tri-fold brochure you find at trade shows and hospital waiting rooms is a form of collateral, there are digital analogs all around you. Every illustration, blog post, case study and social media GIF that supports your marketing campaigns should be cataloged for additional use down the road. 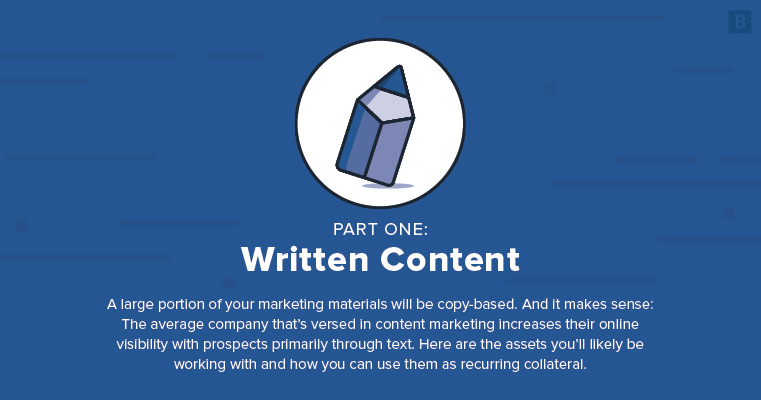 Your one-time investment in content assets thus repays itself several times over each time you grab that evergreen infographic from a few years ago, for instance, and cycle it back into your campaigns. In short, to secure and close leads, you need content at every step of the buyer journey. That’s why we’ve assembled this list of marketing collateral ideas. Blogs are the front doors to your website. They’re perfect for owning keywords in organic search, sharing on social media and curating into newsletters. So, with just one individual blog post, you can publish it on your domain, on third-party websites, via email and social, cut up into shorter micro assets and refer prospects to them via a quick hyperlink. One asset, multiple avenues for ROI. Thank you, trusty blog. Your own brand voice can get stale after a while, and studies show consumers are likelier to trust a company that’s highly praised by others. Case studies present this opportunity en masse. Featuring top clients and their attestations to your expertise on your website and with middle- and bottom-of-funnel prospects helps you leverage your existing clients’ testimonials to earn that last bit of trust needed to close a deal. Gated assets like white papers allow your technical expertise to shine. Put them behind form fills on your site, distribute them via email and use them to collect leads. Your core landing pages are the scaffolding of your online presence – you need that strong foundation first before you can do much else that’s measurable. Product, services, contact and About Us pages are must-haves, and they give you a vehicle through which to talk about your company, your brand and your capabilities as they relate to customers. This one may not be top of mind, but employee bios provide a level of assurance that customers are working with a reputable, talented staff. No matter what type of business you run, you need a handy guide that walks through all of your products and services. This should be formatted, easy to read and client-facing. Pairing text and design elements adds a visual dynamism to your brand image and allows you to tap into the brains of potential customers who may not like reading long emails or complex white papers. 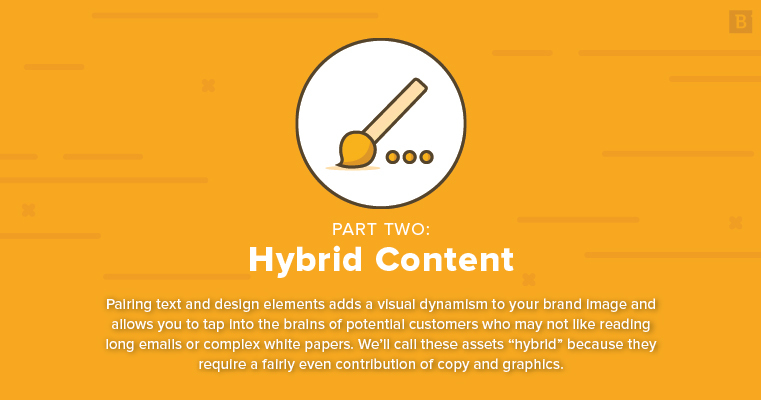 We’ll call these assets “hybrid” because they require a fairly even contribution of copy and graphics. Infographics perform amazingly well through virtually every distribution channel because humans process information visually. By using icons, illustrations, characters, graphical narratives and design cues, you can convey even the most complex ideas. You can also print out infographics and bring them to your next trade show. The more beautiful cousin of white papers, eBooks scale back the text a tad in favor of more color, branding and illustrations. Gate them on their own landing pages and capture leads left and right. Saved as PDFs, you can circulate them via email and even tweak them to be more like SlideShares with clickable page buttons. Calls to action are a necessity. Embed them in newsletters, blog posts, landing pages and more. Your marketing communications must provide next steps for readers/viewers to take, and CTAs are just that conduit. Social media is a visual artform. This is your chance to use feature images with text overlays, .gifs, punny memes and brand-conscious designs in addition to your snappy headlines and captions. The point is to generate comments, likes and shares, so they’re effectiveness is easily measurable. One-pagers are useful in both physical and digital marketing realms, so they should definitely be part of your collateral playbook. They’re immediately recognizable by prospects, applicable to internal discussions and quickly disseminable by sales teams. Your logo is important, but sometimes the logos of your business partners and affiliates are even more important to those becoming aware of your brand for the first time. You don’t need to do any design work yourself; just ask your partners for a hi-res .jpeg of their logos and you can stick them on your marketing collateral to really add authority and emphasis to your messaging. Newsletters are your digital magazines, the way you stay in contact with email subscribers. Include graphical components like images, CTAs and border formatting along with a few clickable hyperlinks to your blogs or gated assets. Custom doesn’t have to imply one-off or ad hoc. You can create a graphics template with your brand colors and drop in new text as you see fit, depending on your current and upcoming marketing campaigns. Showing a portfolio of your best work to prospects lends credence to your marketing and sales pitches. A carefully curated and formatted selection of client success stories can be one of the simplest ways to allow your blood, sweat and tears speak for themselves. Whether physical or digital, a brochure still holds weight as both marketing and sales collateral. They’re easily distributed and can be circulated for an endless number of purposes. Similar to the employee bio, a business card confers a level of sophistication, assurance and credibility that is often understated. Ever have someone ask for your business card and you don’t have one? I have and it’s downright embarrassing and potentially perceived as unprofessional. Adding contact info, CTAs, links to newsletters and other collateral to email signatures is an easy way to promote your brand with every email you send. 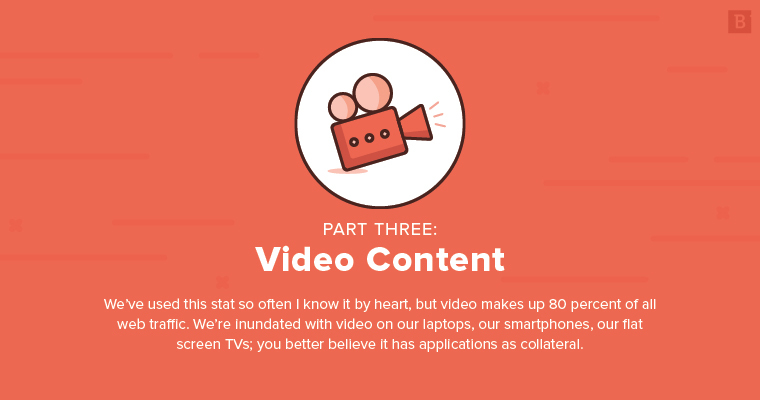 We’ve used this stat so often I know it by heart, but video makes up 80 percent of all web traffic. We’re inundated with video on our laptops, our smartphones, our flat screen TVs; you better believe it has applications as collateral. Using an on-screen presenter, a short 60-second script and a rotating carousel of images, video blogs are digestible in a way that longer-form blogs are not. You can also create them very quickly and publish on a number of channels like your website, YouTube, Vimeo and social media. Either 2D or 3D, animations take the best of scriptwriting, storyboarding and voiceover and fuse them into an effective media. They work great on dedicated landing pages, via email and social and in place of lengthy phone calls with prospects. An animation is meant to convey, convince and convert all within 90 seconds. Essentially Case Studies 2.0, video testimonials put your satisfied customers in front of the camera, empowering them to talk up your brand, rave about your excellence and recommend others to your business. 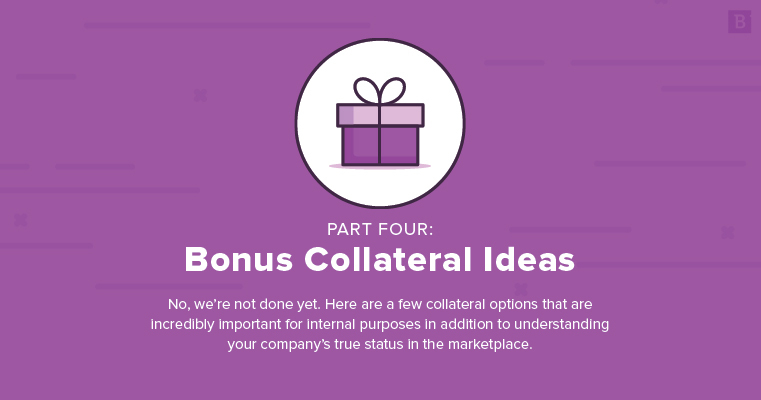 That’s collateral that is as closely tied to potential ROI as there comes. You can think of a web demo as a more appealing stand-in for a sales rep. By demonstrating a product, explaining a service or detailing an intricate process, you let viewers follow along on their own terms. Leverage demos at the middle or bottom of the funnel. Event-based marketing at trade shows, industry conferences and other experiential functions are perfect opportunities for vox pops. They provide a more authentic, off-the-cuff image of your company and employees, which translates well on social media. These may sound cheesy, but, done right, they can speak volumes. Being able to explain your company values in an honest way is invaluable. It could also be one of the first touchpoints you have with a potential customer. Webinars are seemingly everywhere these days. By soliciting signups from webinar viewers you gather leads. You can also email the recording after the fact so that you stay in contact with those who may have missed the original viewing. Is this collateral you would share externally? No. But you should absolutely conduct regular site audits and share the results with internal stakeholders? Yes. That counts as collateral, too. Similar to a sitewide audit, a content audit goes into more detail about your content across all channels. Again, you need this intel to report ROI and to know how to tweak your campaigns. Format your findings into a slick document and brainstorm ways to improve your content. Not only should you audit your own marketing effectiveness, but you should apply the same due diligence to your primary, secondary and tertiary competitors as well. What you uncover serves as the framework for your go-to-market strategy. Every department in your company should have this information bookmarked. It doesn’t matter if it’s 1918, 2018 or 2118, understanding your buyers is Business 101. Researching and developing detailed, formatted buyer personas isn’t just a marketing objective; its utility is universal to your entire organization, from sales to customer service to product dev. If you work with in-house creatives or outsourced vendors, you need brand guidelines that dictate who you are, how you want to be portrayed and how you can maintain these standards. Again, every employee at your company should have a copy of this document. Flyers, promotional products and various trade-show giveaways like branded swag still play a role in your comprehensive brand image. As you know, if you don’t, your competitors surely will. Mike O'Neill is a writer, editor and content manager in Chicago. When he's not keeping a close eye on Brafton's editorial content, he's auditioning to narrate the next Ken Burns documentary. All buzzwords are his own.